The Typing of the Dead (ザ･タイピング･オブ･ザ･デッド) is a Sega NAOMI game released in 1999 based on The House of the Dead 2. While the latter is a standard light gun shooter, Typing replaces the gun with the keyboard. While the game is an educational game, as it requires players to enhance their typing skills to be successful, it has been praised by critics primarily for its comedic content. It was later brought to the Sega Dreamcast and Windows PCs. The success of this game, particularly in Japan, led to many variations of The Typing of the Dead. This article covers the original NAOMI arcade version and its ports to the Sega Dreamcast and Windows PCs. It also includes the Japanese release of The Typing of the Dead US Edition (ザ･タイピング･オブ･ザ･デッド USエディション), as this is the Japanese release of the US version of the game. For the Japanese-only variants, see The Typing of the Dead 2003, The Typing of the Dead 2004 and The Typing of the Dead Syoukai. The plot of the game follows that of The House of the Dead 2 almost completely. The story begins on February 26, 2000, where another zombie outbreak has occurred and several AMS agents have been dispatched to investigate. The player can control two characters, James and Gary, who are first sent to find the original game's "G" before being tasked with restoring order. Responsibility for the outbreaks is soon traced to "Goldman," a banking tycoon and scientist who is attempting to end human control of the earth. Much of the game revolves around destroying Goldman's creations, concluding with the final boss of "the Emperor." There are three possible humorous ending sequences, dependent on how the final questions asked to defeat the Emperor were answered. The Typing of the Dead has been described variously as a remake or mod of the original House of the Dead 2. Like the original, Typing of the Dead is styled as a first-person rail shooter game, but substitutes shooting zombies and other enemies with typing out words or phrases to kill them. When enemies appear, they are accompanied by a box showing a word, sentence or phrase which must be typed to neutralize the enemy. The length, and complexity, of the phrases increase during the game's progression. Other features retained include the challenges of saving survivors, which will alter the path the player character will take to his final destination, and the secrets/bonus items hidden throughout the game. All levels contain specific challenge areas, where the player is required to kill a certain number of zombies in limited time, and are ended with a boss battle using some sort of alteration of usual gameplay (e.g. a long phrase, typing the correct answer to a question etc.) The console ports have two modes, "Original" and "Arcade," for the main storyline, as well as "Tutorial," "Drill," and "Boss" modes for additional typing training. Other changes are mostly superficial, including replacing the weapons wielded by zombies with harmless items and equipping the AMS agents with keyboards attached to backpack Dreamcasts with oversized batteries. 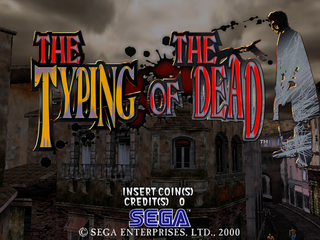 The Typing of the Dead was first released for arcades in Japan in 1999 with a special arcade cabinet equipped with dual QWERTY keyboards. The game was WOW Entertainment and one of the second developments by Smilebit, a developer team from Sega which had recently spun off as a new company. The first home console release was made for the Japanese Dreamcast market on March 30, 2000. The North American release was made the following year in January. A PC port was produced by Empire Interactive, and released in September 2001. Another port of the game was for the PlayStation 2, titled The Typing of the Dead: Zombie Panic. This version was released exclusively in Japan in late December 2004, and was packaged with a USB keyboard. The game was mostly unchanged, disappointing observers hoping for an update of the graphics, although the Dreamcast backpacks were replaced with PS2 backpacks and new "minigames" were incorporated into the main story. The demos of these releases can be found on the official Typing of the Dead Japanese website. A sequel game, The Typing of the Dead 2, was released in 2007. This version was a revision of The House of the Dead 3, and has only been released in Japan as of 2008. Main article: The Typing of the Dead/Magazine articles.